Making changes and exploring new opportunities can be unsettling, but if you have the right attitude and approach everything with a smile, like Joyce, you can make a new situation a great one! Meet Joyce. A funny, charming, fun-loving and kind woman who stayed true to herself even in the midst of change in her life. She was working at Summit DD’s Ellet Center, but Joyce and her family were very open to trying something new, especially knowing that Summit DD is transitioning out of providing direct services and the Ellet Center would be closing in the coming years to meet a federal mandate. Joyce and her support team of her family and Summit DD Service and Support Administrator (SSA) met to discuss different options to find what could be the best fit for her. Dawn explained that it is her job as a Summit DD SSA to make sure people are successful and have all the supports they need to live a happy and fulfilled life. Her role is to listen to their needs and wants and provide choices so they can be empowered to reach their goals. Joyce and her family wanted to explore options similar to Summit DD’s Ellet Center, but wanted a place that offered more opportunities for her to interact in her community. 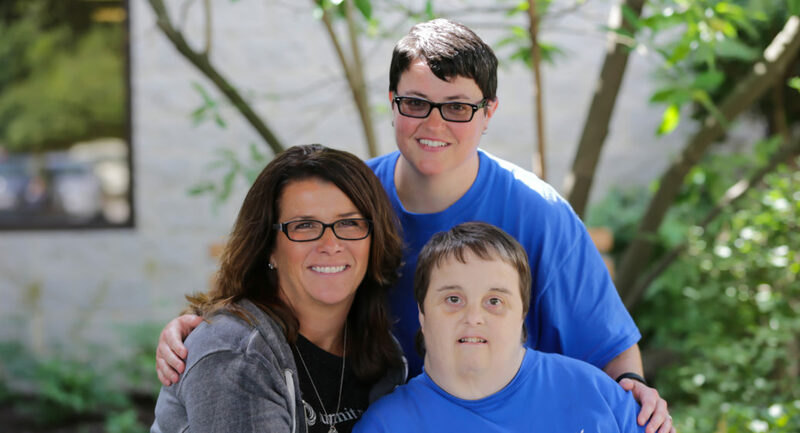 “Joyce and her family visited [other providers] and it only took one visit to her new provider for Joyce and her family to know it was the right fit,” Dawn shared. Joyce moved to United Disability Services (UDS) BraVo! Program, which stands for Building Relationships and Volunteer Opportunities. In this program, people with developmental disabilities participate in volunteer opportunities and service learning projects integrated throughout the community. BraVo! also teaches participants how to be involved and active in their community. The program has accumulated nearly 60,000 volunteer hours helping over 40 organizations throughout Summit and Portage counties since its inception nine years ago. Similar to Summit DD’s Ellet Center, this program also has in-house projects and supportive staff that help develop skills to achieve every individual’s personal goals. UDS also provides Joyce’s transportation to and from the program. Courtney further explained that the BraVo! Program focuses on developing important job, communication and social skills such as teamwork and leadership, as well as fostering an inclusive and inviting community for all. When Joyce was asked if she was happy coming to UDS she exclaimed “Oh, God yes!” She also shared that she enjoys the places she volunteers at in the community and the new friends she has made at BraVo! Dawn and Joyce have known each other for over 10 years and will always be great friends. Joyce knows Dawn is only a phone call away to support her in whatever she needs throughout her life. “I think the future is whatever Joyce wants it to be,” Dawn concluded.